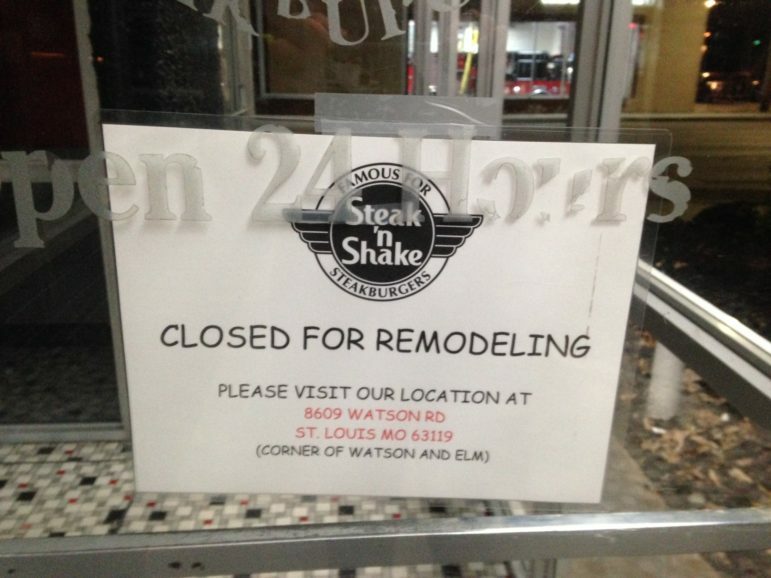 The Maplewood Steak ‘n Shake is closed for remodeling, according to a sign on the door. Given this location and my experience with it, “remodeling” might just mean scraping the inch of grease off the floor and wiping down the tables with a rag. I stopped going there years ago. I gave it another try last year and it reinforced my decision to not return. First time that caused me to stop was that my fries had bits of black dots all over them. I talked to the manager and he said ‘oh, they haven’t changed the grease in the frier in a while’. Really. Aren’t you the manager, isn’t it your job to make sure they do that? When I tried it last year, I complained about the service and quality of the food. The manager comped my check, and said ‘I can’t get good help’. So sad. Service is poor, tables always dirty. I drive to Webster or Kirkwood for my SnS fix, and I go there at least 2-3 saturdays a month. Please get new staff and new management, I want to keep my money in Maplewood. I love that Steak N Shake. The employees have always been very friendly to me and I’ve always had great service. Although the service is slow when it gets busy. The cooks need to up their game a bit. I’ve sat at the counter and watched. They really don’t know how to handle more than a couple of tickets at a time. I went there on Friday and saw the barriers but no sign to indicate what was going on. Wanted to use a gift card. Called the Hampton restaurant and they are still open. The food was good. Had no problems at all. 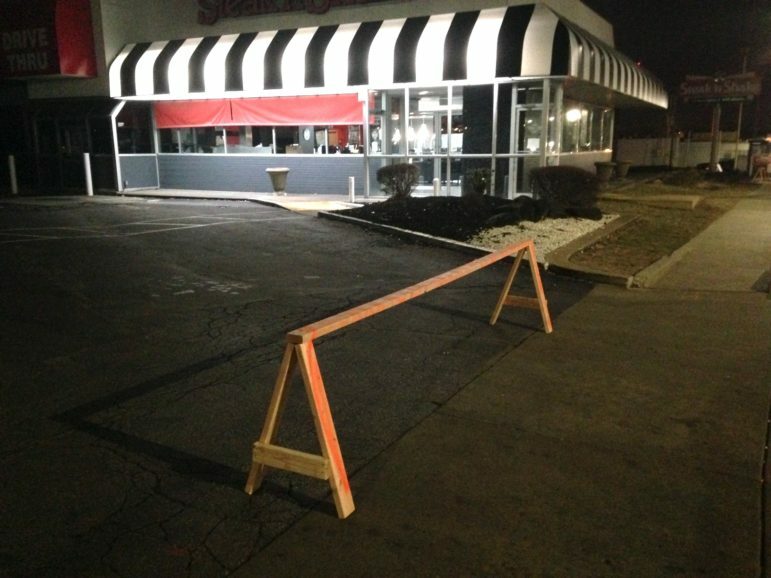 I learned from other Steak n Shakes, though, it’s not a place to go if you are in a hurry. That place is terrible. I have not attempted to go there in over a year. The last 3 times I went through the drive through, they forgot an entire burger and I had to go inside. Hopefully this remodel includes an entire new staff. I would give you a thumbs up if I could! They have had crappy service for a while. With that said, not everyone there was horrible but the overall service really was poor. The last few times we went, we ordered shakes and they weren’t ready until 10 minutes after we were finished with our food! What good is ordering a shake to go with your meal and the dang thing doesn’t show up until you are ready for your bill! Maplewood SnS is one of the worst around, unfortunately. It’s been tough to get served there for the last year or so –both the dining room and the drive-thru. Every time I try to go there adds another layer of disappointment. Their milkshakes are also vile sugar bombs that taste like bad breakfast cereal. I must be the lone dissenter here. I like Steak n Shake. The servers have given me good, pleasant service every time I’ve been there. I like their food, too. You can find out by asking the city of Maplewood if SnS actually took out a permit for remodeling. Yes, it would be interesting to see if anything has been filed with Maplewood. Supposedly the Fairview Heights Illinois location closed for remodeling a while back and it no work has been started. “Real” Steak n’ Shakes–and by that I mean the initial stores that have been in MO, IL, IN, FL & GA for abut 80 years have all suffered under their massive expansion. They have stores all over the globe now– no table service & a more streamlined menu–even in Paris & Dubai. Their 2 biggest problems are that their menu is way too big and they need to pay their employees better. The turnover at all of the stores is extremely high, which always means poor service. I hope it gets fixed. I truly want them to succeed. I have to agree with Uncle Jedd and Jamie. The service level of the employees at the Maplewood store has been poor for a number of years. The drive through was a good place to catch a cat nap. I don’t know personally about the food quality. Treat me bad once, I’m on guard. Twice, I never return. I haven’t been in Maplewood’s Steak ‘n Shake for over 20 years. With that large parking lot, there is plenty of room for an expanded restaurant, and if they could aquire that space next door that is a shabby relative of Brentwood Volvo, even more possibilities are available. Maybe a Sybergs………. Yes! Not what it used to be.. Nothing is…Schnucks is worse, Target is worse, S teak and Shake is the only fast food I go to so I cant say anything about Burger King, Wendys, etc. But I assume they are worse too. Sounds good. Maybe they will remodel their employees and service as well. it will take quite a bit of work for me to give that place another try.